The people of Uganda, their grand children will all have to pay the loans procured from World bank as of now. It is incumbent upon the top Executive at the World Bank to ensure that he follows up the money released for use and that the right projects are financed. if the World Bank pays a lip service, then it will be most unfortunate as some people can shamelessly steal the money as it is got from World Bank. It is sad, but a reality that some people who otherwise would be respected by the people of Uganda are eating donor money as if there was no tomorrow, and without shame. 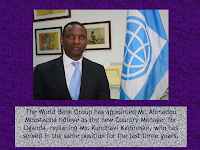 KAMPALA, January 09, 2012 – The World Bank Group has appointed Ahmadou Moustapha Ndiaye as the new Country Manager for Uganda, replacing Kundhavi Kadiresan, who last year was appointed Country Director for Malawi, Zambia and Zimbabwe. Ndiaye arrived in the country on Monday, January 03, 2012 to start his new assignment. A Senegalese national, Ndiaye is the first African national to work as Country Manager for Uganda. He joined the Bank in 1998 as a Financial Management Specialist in the Senegal Country Office and rose through the ranks, holding various international positions, with his most recent assignment being Manager, Financial Management, in the Eastern Europe and Central Asia Region. He holds a Master in Business Administration and is Qualified Professional Accountant. “I am excited about serving in Uganda at this critical time when the economy has experienced some turbulence but also as the country looks forward to harnessing its oil resources. I hope to quickly settle in and build on my predecessor’s work to effectively implement the Uganda Country Assistance Strategy, as well as foster dynamic dialogue with the new Government and all stakeholders,” said Ndiaye. 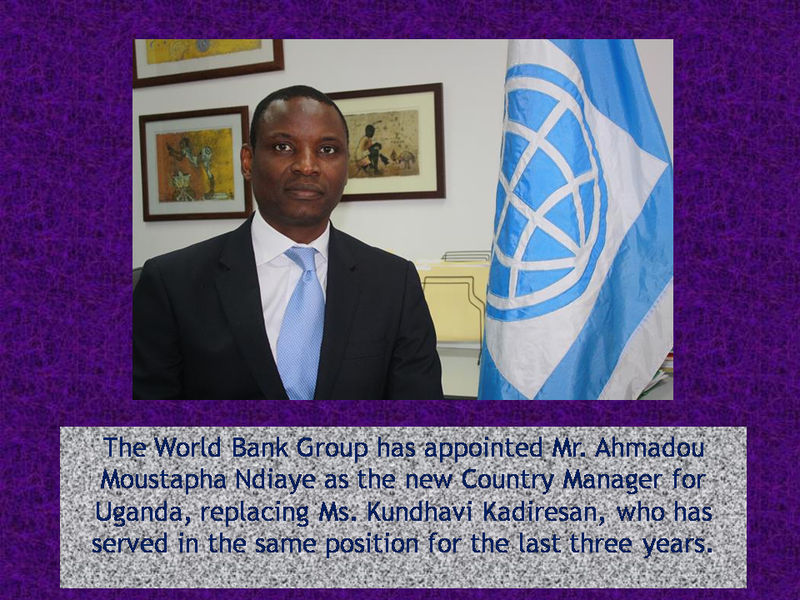 In his new position, among Ndiaye’s top priorities will be to lead and support staff in implementing the priorities of the Bank’s Africa Strategy and the Uganda Country Assistance Strategy while adjusting to corporate realities and opportunities. He brings to this position a unique and exciting combination of experience and skills, from working in Africa, Latin America and the Caribbean and in Europe and Central Asia , and at the corporate, country and sector levels. Uganda has one of the Bank’s biggest five portfolios in Africa. As at the end of December 2011, there were 23 Bank-supported projects with net commitments of over $1 billion. The International development Association provides on average approximately $300 million per year to Uganda, about half of which is in the form of budget support through the Poverty Reduction Support Credit (PRSC) instrument, with contributions from multiple donors. The Bank also is actively engaged in analytical work in collaboration with the government on priorities under the government’s National Development Plan. The Uganda Wildlife Education Centre (UWEC) has distanced itself from sections of report findings by a probe committee on the mismanagement of funds in the protected areas, concerning the centre, citing distortions. The letter dismisses reports that former Uganda Wildlife Authority executive director Andrew Seguya asked acting UWEC executive director James Musinguzi and staff to lock out the commission of inquiry from entering the premises to conduct investigations on the alleged mismanagement of the World Bank and Protected Areas for Management and Sustained Use (PAMSU) funded project. “Dr Seguya only advised that the commission should be let into Uwec, upon which the Uwec management should ask what the commission wanted..,” the nine-page letter reads in part. 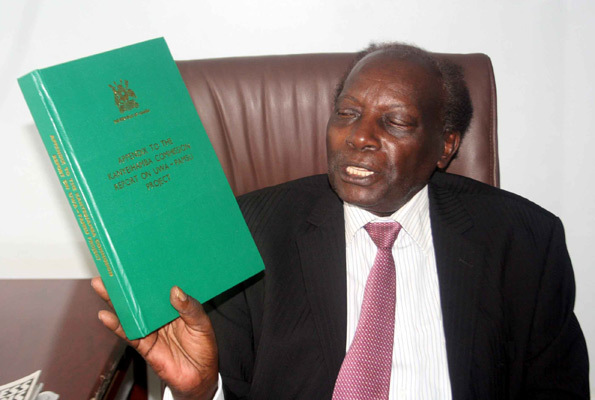 Retired Supreme Court Judge George Kanyeihamba chaired the commission of inquiry to investigate the alleged mismanagement of funds totaling to $38m (Shs108b) from the World Bank and another Shs17 billion of taxpayers’ money under PAMSU project between 2002 and 2008. The funds were meant to improve facilities such as roads, observation points, offices and ranger quarters in 10 national parks and 12 game reserves. Although the report indicates that the commission was informed that many of the buildings constructed under the PAMSU project had complied with its plans, not all the money released could be accounted for. The Uwec letter states that they never discussed any issue to do with buildings and plans of PAMSU project since they could not speak authoritatively about the buildings that were constructed in their absence. The letter also dismisses reports that during the visit to Uwec, the commission was informed that some Uwec funds were diverted to Dr Seguya for personal use. “We would like to vehemently put the record straight that at no one point did we inform the commission about this, neither do we know of any Uwec funds diverted by Dr Seguya. We were in a meeting as top managers of Uwec and all that transpired is what is recorded. We feel this was a discrepancy that should be put to record,” reads the letter. State Minister for Tourism Ephraim Kamuntu said the letter is the second after another team that petitioned the High Court to quash the report because of the many questions raised on its professional and ethical standards. “I have never received this report formally as the Tourism minister per the terms of reference. I got it through a journalist who asked for my comment on the report,” he said in a separate interview. He said he was appointed Minister for tourism six months back when the project ended in 2009 but is surprised that he was implicated for causing economic crimes leaving out the then ministers of tourism.